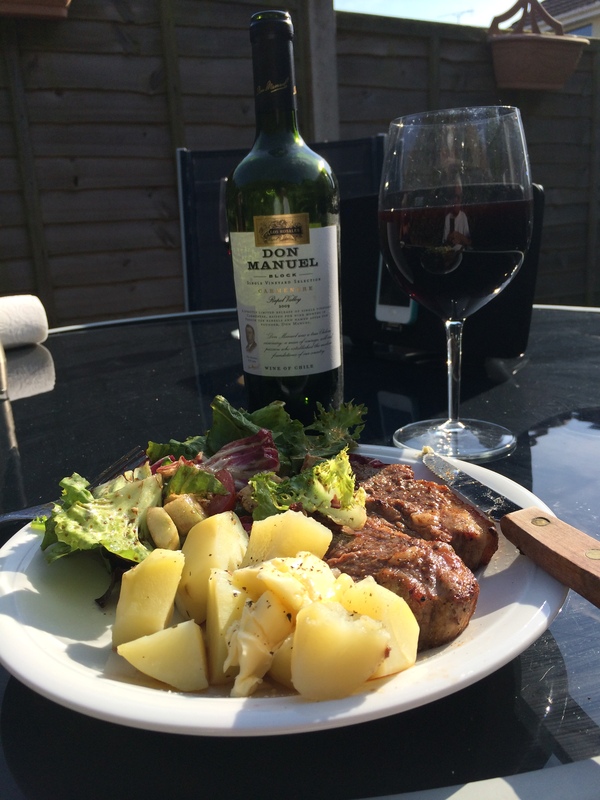 We decided to cook some steak on our barbecue and chose Rump Steaks with Mustard and Brandy Sauce from Supercook. 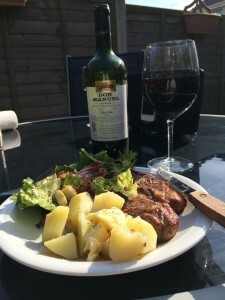 The steaks are rubbed all over with crushed garlic and French mustard, then grilled and a brandy, cream and paprika sauce is poured over them. We served the steaks with chunky oven chips, grilled portobello mushrooms and roasted tomatoes. Like many we enjoy a Malbec with steak. 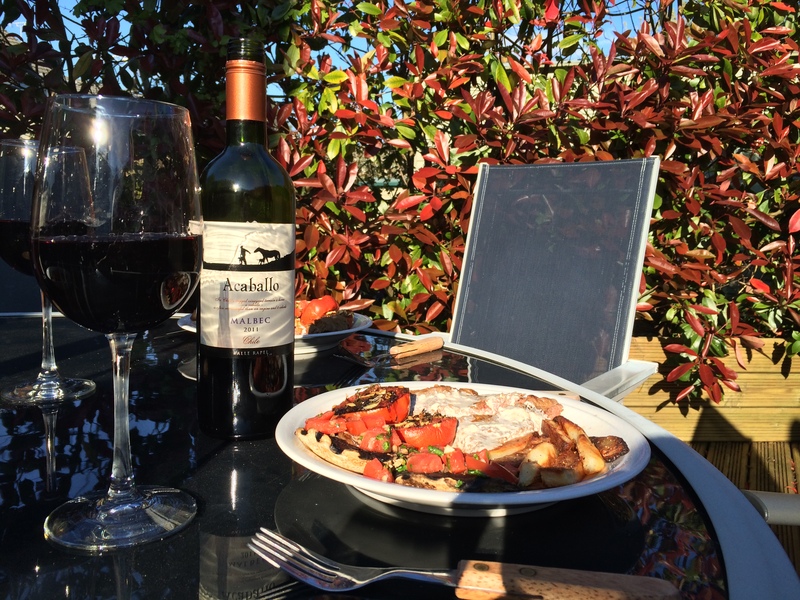 While these are usually Argentinian, we enjoyed a Chilean one – Acaballo Malbec 2011 from the Sunday Times Wine Club. We tasted mainly red fruits, vanilla sweetness and a smooth, chocolaty creamy finish. A very good match with the steak. 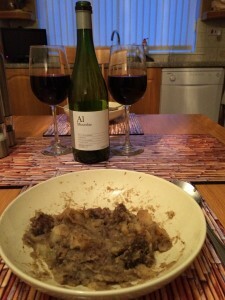 We tried Meat and Potato Hotpot, a Supercook recipe. 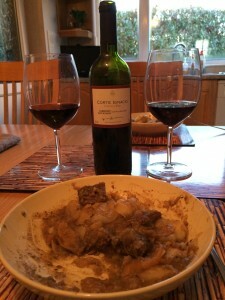 Braising steak is slow-cooked in the oven with potatoes, onions, swede, thyme, Worcester sauce and seasoning. A warming Winter’s meal. 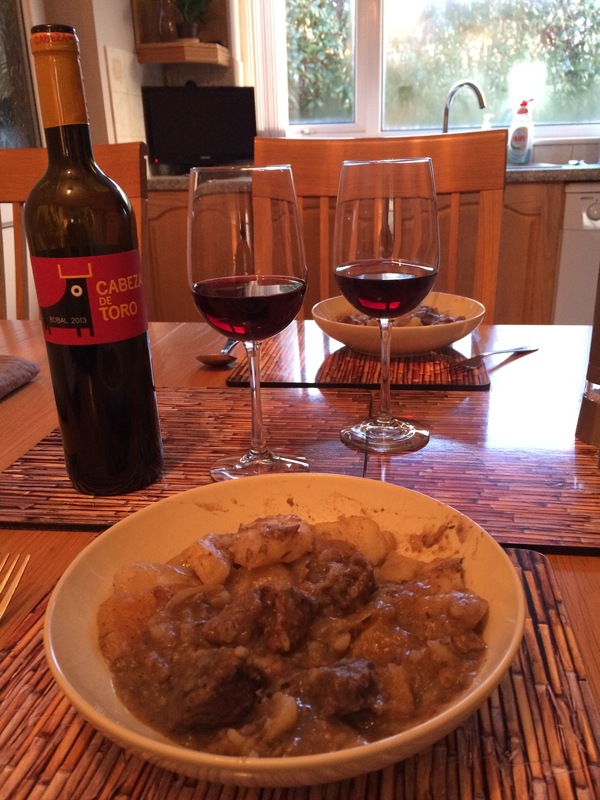 We thought a bottle of Cabeza de Toro Bobal 2013 would match. This pleasant medium-bodied Spanish red from the Sunday Times Wine Club had some sweetness to match some of the Hotpot’s ingredients, but it wasn’t powerful enough for the meal, so we set it aside. We then tried a bottle of Corte Ignacio Concha y Toro Cabernet Sauvignon 2012 a full-bodied Chilean red from the Wine Society. We tasted predominantly blackcurrants with a lingering savoury earthiness that had an affinity with the swedes in the dish. A good match. We did even better with the lefovers though. 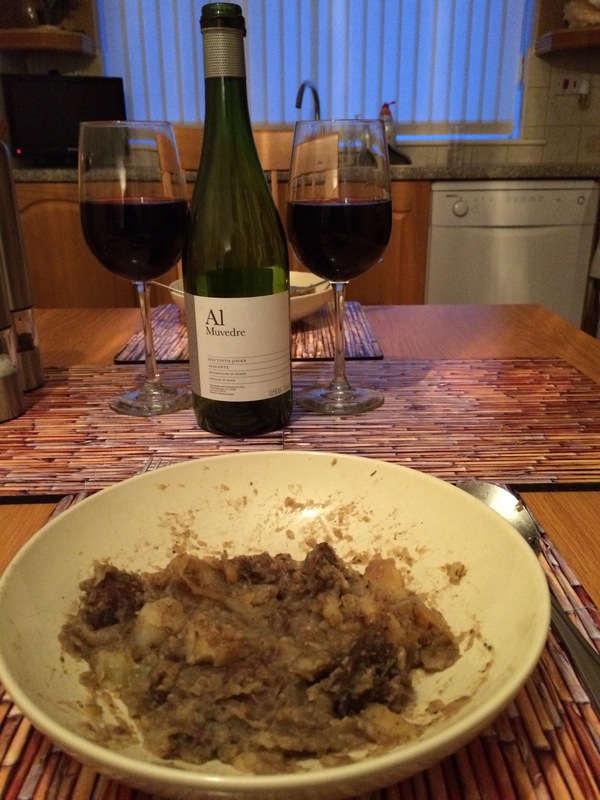 We paired the Hotpot with a bottle of A1 Muvedre 2012 Tinto Joven Alicante, a medium to full-bodied red also from the the Wine Society. We tasted red fruits, plums, a vanilla sweetness and some spiciness. A very good match with the meal. Ras El Hanout is a classic Moroccan rub for lamb, fish or chicken and contains coriander, cinnamon, ginger, lavender flowers, rose petals, black pepper, cayenne pepper, cassia, galangal, pimento, mace, nutmeg, cardamon and clove. We coated some lamb loin chops with a little olive oil, rubbed on some Ras El Hanout and grilled the lamb on the barbecue. We served the chops with Jersey Royal potatoes and Feta salad. To go with the meal we opened a bottle of Los Rosales Don Manuel Block Carménère 2009, a full-bodied Chilean red from the Sunday Times Wine Club. We tasted coffee, dark chocolate, vanilla and plum sweetness, with underlying black fruits and a slight spiciness. The finish was complex, rich and smooth. 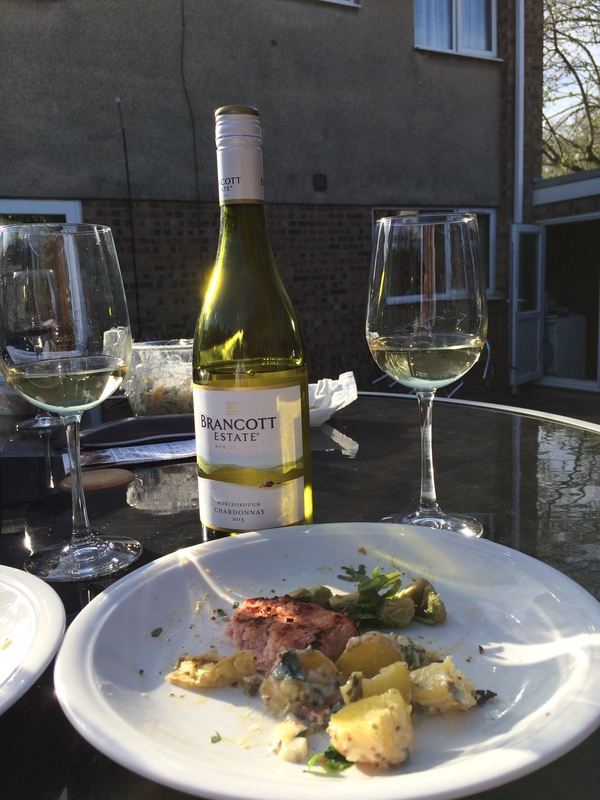 We thought this wine was an exceedingly good match with the lamb. 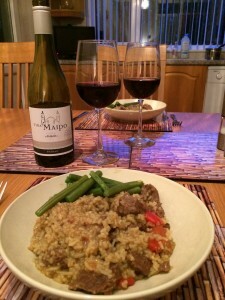 We enjoyed one of our favourite Supercook recipes that we hadn’t cooked for a long time. It’s a hot, spicy beef and rice stew from Cameroon called Dos. The stew contains stewing beef, green chilli, bay leaf, cayenne pepper, turmeric, cumin, chilli powder, ground coriander, onion, tomatoes, green pepper, water and rice. We served it with green beans. 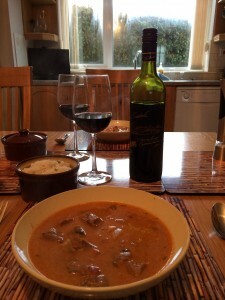 Whilst the stew has strong spicy flavours it tastes completely different from a curry. To pair with the stew we chose a bottle of Viña Maipo Shiraz 2012, a full-bodied Chilean red from Tesco. There were blackberry aromas and this was followed through on the palate with black fruits, vanilla sweetness and chocolate spiciness. 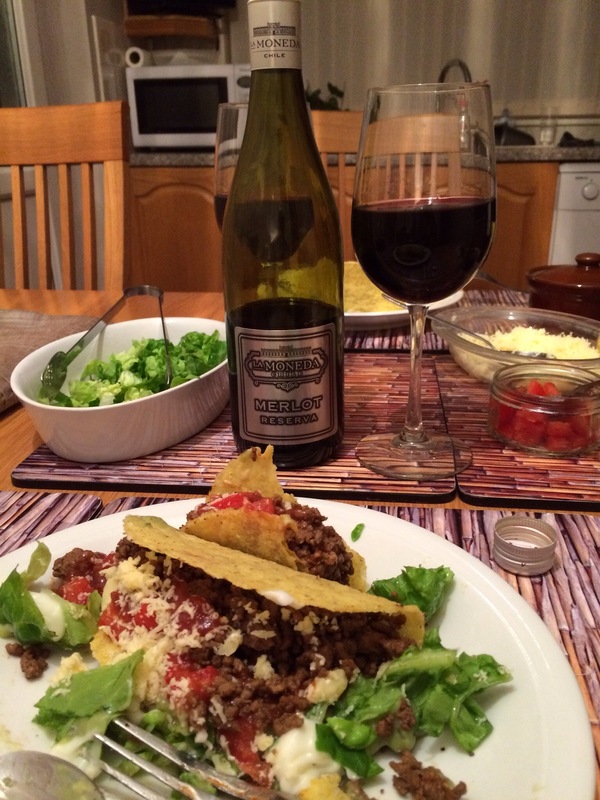 The pairing improved as the meal progressed and overall we thought it was a good match. Teresa slow-cooked some beef brisket and made a red wine sauce to go with it. We served the meat with roast potatoes, Yorkshire Pudding, broccoli, parsnips, carrots and swede. To complement this fine meal we opened a bottle of Casa del Rio Verde Cabernet Sauvignon Reserva 2008, a full-bodied Chilean red from the Sunday Times Wine Club. We found the wine smooth and velvety with blackberry and plum fruits and vanilla sweetness from 6 months aging in French oak barrels. A very good match. 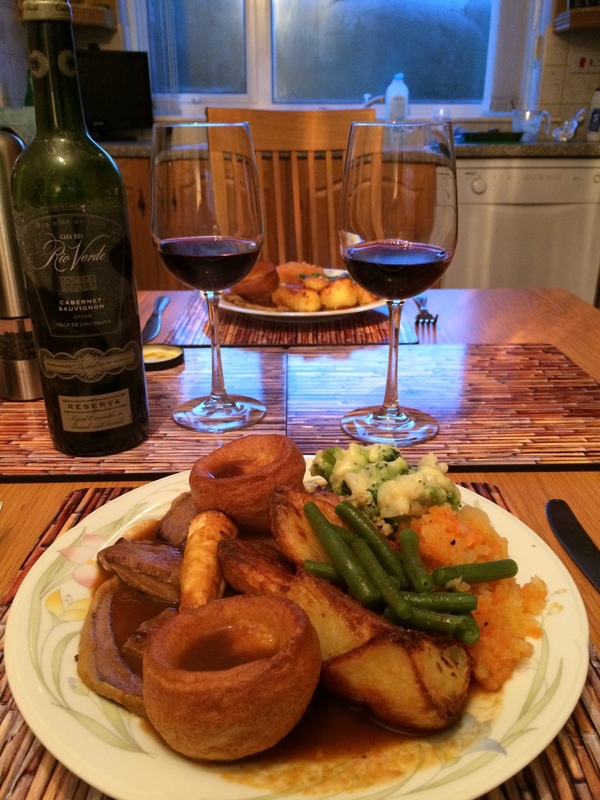 A couple of days later we had the remainder of the brisket with another Sunday Times Wine Club wine – The Hundred Cabernet Sauvignon Reserve 2011. 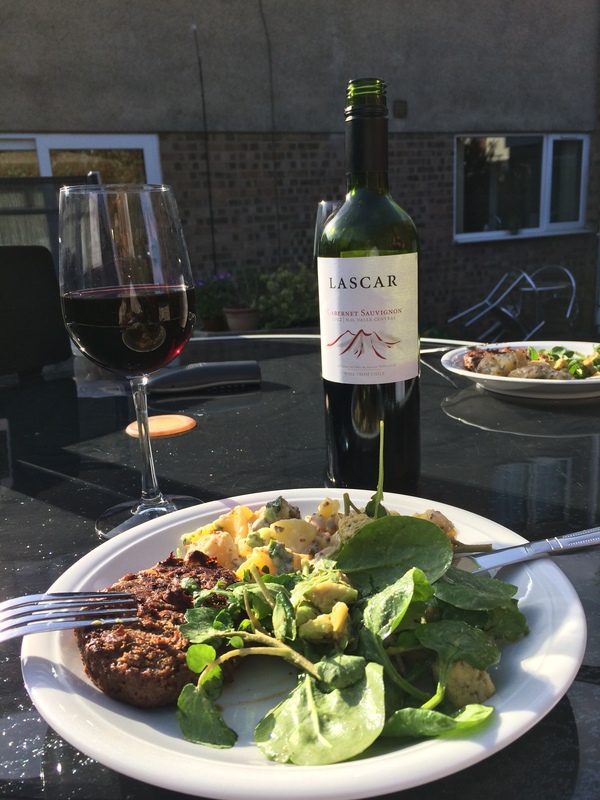 This full-bodied Australian red from Coonawarra had characteristic mintiness and was just as good with the beef. We tried Allegra McEvedy’s Daube of Beef recipe from Economy Gastronomy. Cubed braising steak is cooked with shallots, bay leaves, lardons, thyme, garlic, red wine, beef stock and a tin of beef consommé. 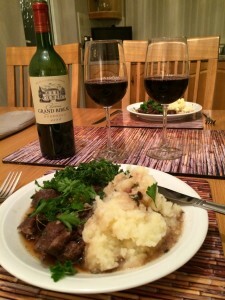 Unusually for a daube the recipe did not call for marinating the meat beforehand. We served the daube with mashed potato and curly kale. 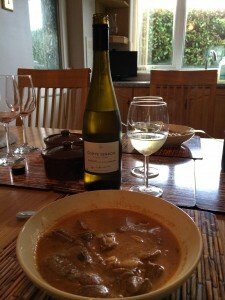 Whilst we found the recipe pleasant, we didn’t detect as much depth of flavour as more traditional daubes we have cooked . We thought a Bordeaux should be a good pairing with the dish and opened a bottle of Chateau Grand Bireau 2008, a medium to full bodied red from the Sunday Times Wine Club. 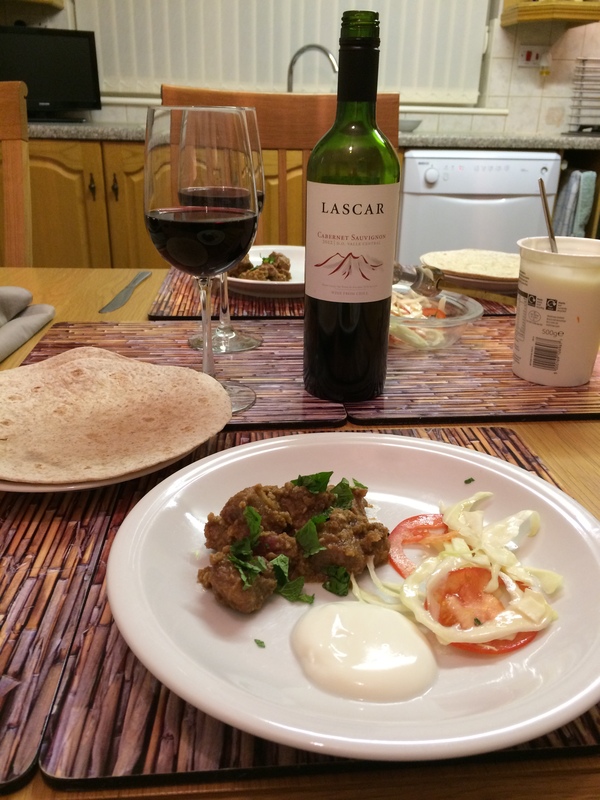 We enjoyed the plum and blackcurrant flavours and smooth tannins of this Merlot-based blend. A good match with the meal. The next evening we finished the remainder of the daube, which had been thickened with cornflour and the flavours had also intensified a bit. 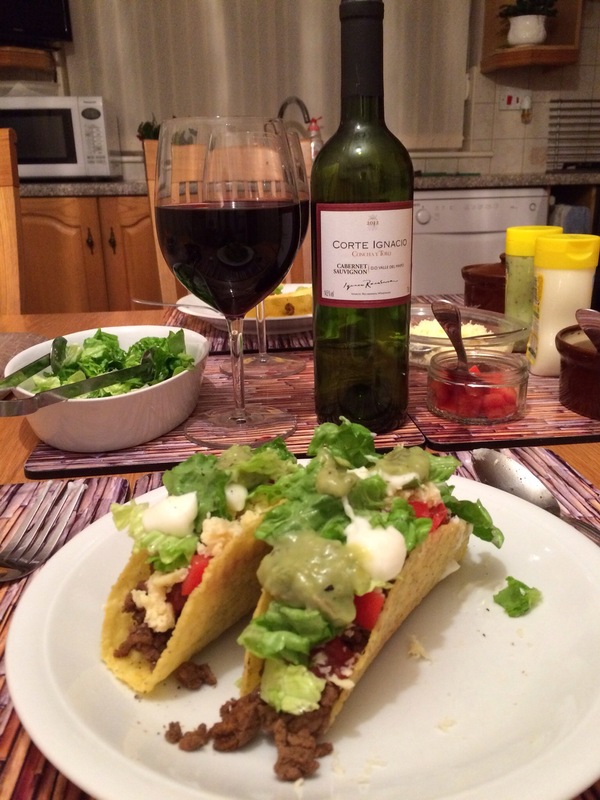 This time we chose to pair it with a bottle of Los Gansos Cabernet Sauvignon 2011 Cono Sur, a Chilean red from the Wine Society. This wine delivered blackcurrants, plums, with some spiciness and smooth vanilla. Another good match.